A beautiful bronze reflecting the way Rawlin's likes to work with interchangeable artistic views of subjects that are familiar to us. He puts a different slant on a formed item & a natural item. 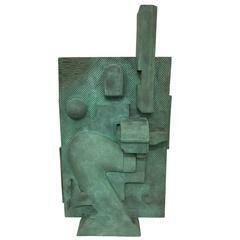 This is a really tactile piece of bronze casting. 33.5 x 20 x 10 cms weight 4.8 Kg Tim was born in Derbyshire, England & from an early age was attuned to the natural world. He came to art later in life and forges his sculptures using mainly the lost wax technique. 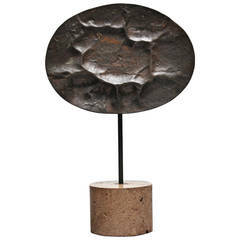 His materials are bronze, steel & iron. Living in the idyllic setting of the Black Mountains Tim's work engages all our senses & emotions. Aesthetics are crucial to his work and his attempts to make sense of life experience by creating something coherent, meaningful & peaceful out of chaos, randomness & complexity. Rawlins rarely constructs maquettes, preferring to ensure all his energy & inspiration are channelled into the piece. 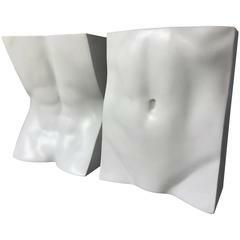 Casting is a process that's raw, visceral and dramatic, almost fundamental yet Tim's sculptures are deceptively easy to look at; curvaceous and seductive. The entire casting process is pivotal and unlike many sculptors Rawlins pours his own works so that he's in touch and in control of the creation of each of his pieces from inception, through casting and ultimately to the finished sculture. His works beg to be held and touched to experience their textural quality & the joy of their creation. Rawlins has exhibited widely in the UK in both solo and group shows and his works are held by many private collectors. He also runs workshops to pass his love of forging & casting bronze on to a wider audience; these courses utilise everyday items gathered from nature to create a lasting testament to beauty. As an Art Psychologist Tim understands the elemental power of art & how healing can be achieved through its various forms. 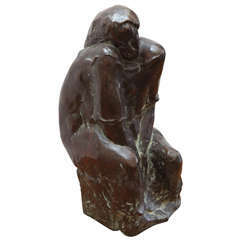 Hand-cast, bronze sculpture of a seated woman by listed, Swiss artist, Robert Lienhard (1919-1989). Signed and numbered on base, #5 of 7. 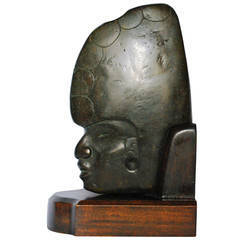 Cast bronze Mesoamerican sculpture. 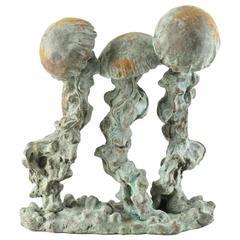 Vintage bronze casting of Mesoamerican stone hacha on original custom mahogany base. Dimension: 13" H x 8" D x 5.25 W.